You know all those socially-challenged people who would rather read a book—or write a book—than anything? 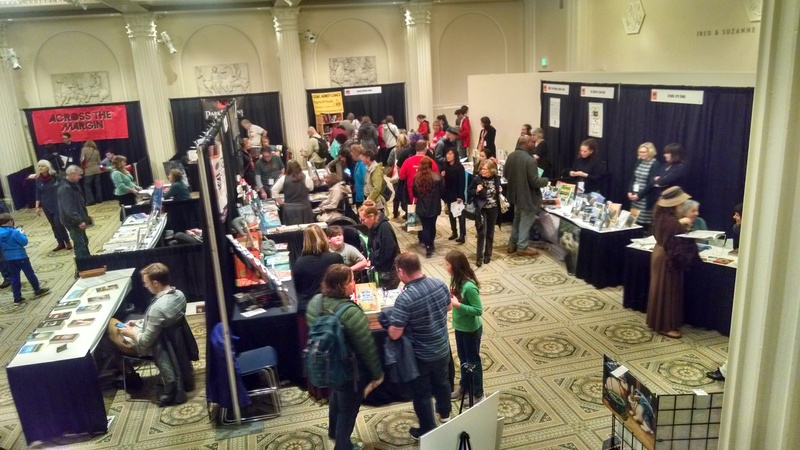 Well, about 8,000 of them gathered in Portland, Oregon Saturday for the mega-event known as Wordstock. Unlike at the famous rock concert with the similar name, folks at Wordstock were stoned on books instead of drugs. The stage performances were all about words instead of music, and the only naked people were the sculptures at the art museum. Still, it was pretty mind-boggling. Alice Hoffman over here, Sherman Alexie over there, Richard Russo across the street, workshops all day, books to buy everywhere, oh my God. 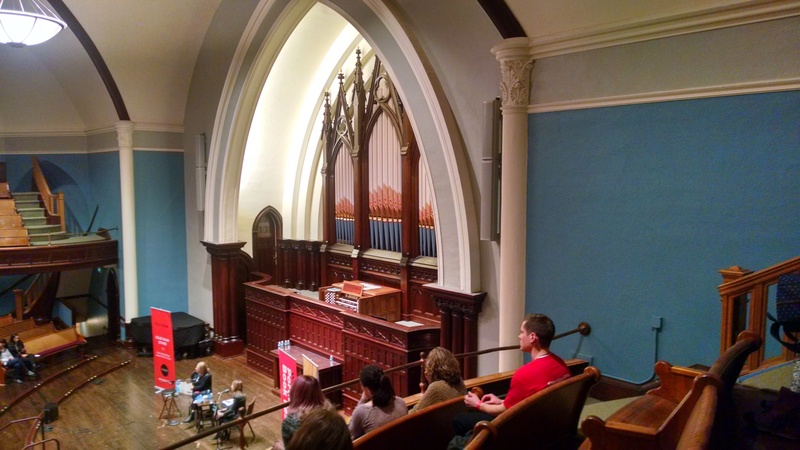 Wordstock’s hub was the Portland Art Museum, but within easy walking distance, other events happened at seven other venues on the South Park blocks, including the Arlene Schnitzer concert hall, the glorious First Congregational United Church of Christ, and the Oregon Historical Society. Red Wordstock signs appeared everywhere. The people I met leaving the parking garage were also going to Wordstock. Of course. Everyone was going to Wordstock. Well, there was that guy yelling in Spanish at a mannequin in a store window. But everybody else. I was a Wordstock virgin, compelled to go this year not only because I always wanted to but because I’m now co-coordinator of our Willamette Writers chapter in Newport. We had a table at the Wordstock book fair. If I volunteered a couple hours, I could sell my books. Portland is a long drive from here. Three hours each way if I’m lucky. Much of it was in the dark, and it was raining the whole time. Blinded by the deluge, I prayed my way home and still can’t believe I survived. I also can’t believe the guys in pickups who passed me going 75 mph on Highway 20. God watch over the people in their path. * Once you pay your $15 (do it in advance online) and get your red wristband, you can attend any of the talks in any of the many buildings. Just walk in. This blows my mind. I thought you needed to pay more for an extra ticket. Nope. * Get the program online at Literary Arts or in the Willamette Week newspaper and plan ahead. There is way too much to see and do. Picture a massive buffet at which everything looks delicious, but you can only choose one plate-full. Which do you want more, the lobster or the raviolis? * Don’t open that door to the stage balcony between shows. I decided I wanted to sneak a peek at one of the theaters and got locked in. Locked double doors on each end of a concrete-floored hallway. Luckily there were stairs. Eventually I wound up in an alley. As the doors shut behind me—locked—I gazed at the wrought iron gates that separated me from the street. What if they’re locked, too? I pictured myself gripping the bars like a prisoner and hollering for help. But they opened. * Expect to get wet. It’s November in Oregon. You will get wet walking between buildings. You will get wet acquiring food from the food carts. You will get wet trying to find a place to eat that food. Wear your raincoat; think about bringing an umbrella. And don’t even think about complaining about the rain. * It will be crowded. Did I mention there were 8,000 people there? That’s almost the whole population of Newport. Most of these people are too busy gazing at books, authors, their programs or their phones to watch where they’re going. If you try to take an alternate route, a red-shirted volunteer will herd you back into the stampede. Note that many of the attendees are kids, who get in free. * If you live far away, stay overnight so you can start Wordstocking the minute it opens and stay to the end. None of this sneaking out to beat the traffic and the darkness, neither of which is actually possible. * You’re in an art museum. Take time to enjoy the art, too. Featured this year was the work of pop artist Andy Warhol, famous for his Campbell’s Soup Cans and prints of famous people. Wild and colorful stuff. It’s all pretty amazing and a little daunting for this small-town author who skipped her church bazaar to attend Wordstock (which my phone keeps autocorrecting to Woodstock). Of course I spent more money than I made selling books. I thought I was going to die on the road. But will I go next year? As long as Literary Arts keeps putting it on, I plan to be there. Unless it’s snowing. Maybe even then.